mmon one. But only a handful of owners really know anything about diarrhea’s varieties and causes. ery likely to suffer diarrhea. A change in drinking water, especially when traveling, can also cause temporary diarrhea. Abrupt changes in diet are particularly distressing to puppies whose intestinal tracts are still very sensitive. If you purchased your puppy from a breeder, you have probably been told what to feed the dog based on what he had been fed in the past. If, on the other hand, you got the dog from other sources such as a friend or an ad in the paper, it is advisable that you find out what he is eating. In any case, you should consult about your dog’s diet with a vet. There is always the chance that the dog is not getting the proper nourishment he needs. If you find that your puppy has been used to a raw meet diet and you are going to feed him a commercial food product, be sure to make the transition a gradual one. Start by mixing just a bit of the commercial food into the raw meat. Gradually increase the amount, day by day, until you have completely eliminated the raw meat. This gradual change will prevent your dog from suffering diarrhea. Other causes of diarrhea are overfeeding and underfeeding. A dog that is very hungry and overeats is apt to get sick, as is a dog that is fed less than once a day. Such a dog will usually overeat when he is finally fed. All the evidence reveals that dogs are less subject to diarrhea if they are fed half a total amount twice a day, rather than the whole amount at one feeding. Many breeders, as well as veterinarians, recommend self-feeding, where the dog is left a full dish of food to eat as he chooses. Only dry commercial food is used in this situation, and diarrhea is very rare. Another cause of diarrhea is excessive water consumption. The dog that drinks too much water is often suffering from something more serious than diarrhea, and a visit to the vet is recommended. During the months of summer, of course, it is something else again. 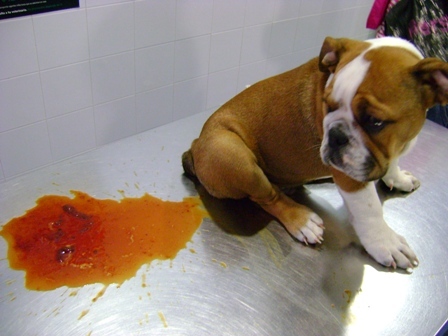 Dogs, like humans, tend to overdo the liquid intake and diarrhea becomes more common. wdust or soap, any of which can cause serious digestive problems. p to hook. Therefore, feed your dog less in the summer and never increase the amount of his food. Sometimes, the cause of diarrhea has to do with specific elements in your dog’s diet. For instance, egg whites, unless they are cooked, will cause diarrhea. The same is true with excessive lactose. Therefore, do not feed your dog too much milk or milk products. In older dogs, a heart malfunction can signal diarrhea. So can a malfunction of the kidneys or the liver, abdominal tumors, and many other conditions. All dogs can get diarrhea from such intestinal irritants such as salts and acids or from the ingestion of foreign matter like toy balls, splinters, or lint. Normally, a dog’s diarrhea will pass in a day or two. Be sure to avoid milk or broth, and mix some cooked rice or macaroni with his regular food. If the diarrhea lasts after a few days, or if it is accompanied by blood in the stool or vomiting, contact your veterinarian.